Content is king. Consumers are looking for up-to-date information about virtually every brand--your brand. How can you deliver timely content and keeps costs down? Content Management can be the silver-bullet in your brand's arsenal. One client of DMI Studios' that leverages our Content Management System is Port Washington, WI. Port Washington needed a website that combined the identity's of their tourism industry, chamber of commerce and main street programs. In addition, each identity had a wealth of information that would need to be routinely updated. When searching for a web design agency that was up to the task, Kathy Tank, Executive Director for Port Washington Tourism Council knew she could look to DMI Studios. "I knew [Brad of DMI Studios] well enough to know that he would not misrepresent what DMI could do, just to get the deal. When I talked about the challenge we had, needing a website for three distinct entities, combined into one website, without any of the entities losing their identity, [Brad] said he knew DMI Studios could come up with a solution." The challenge was steep. Port Washington needed a website for the three separate entities that was easy to navigate and consolidated, yet distinct for each identity. In addition, each entity had differing needs for DMI's Content Management System. Once the website was created, Port Washington was armed with a unified brand for three entities and DMI's Content Management System. Now, their dedicated staff are able to update the website quickly and easily; making visitportwashington.com the go-to website for their distinct audiences. "People say it [the website] looks very professional, and being able to update it when needed helps us to keep the site vibrant and up-to-date with the latest information. That makes Port Washington able to compete with the big guys." says Kathy. Website's have precious few moments to capture a user's attention before they click away and find another source for information. About the website DMI created, Kathy notes, "People say [our website] is easy to navigate and they can find what they are looking for." User experience is key in creating a valuable resource. A major benefit to DMI's Content Management System is the ability to control costs as well. "The easy-to-use CMS keeps costs in-line with dedicated staff being able to update content and manage the website without having to pay anyone else to make the changes," Kathy noted. That means more updates on-the-fly. Kathy explained, "[There are] no financial boundaries keeping us back from using the website. This keeps the website vibrant and refreshed with the latest information and helps us do a better job of communicating info about Port Washington to our audience, thus helping us to drive more tourism visits and business for our economy." Timely content is the key to engaging customers on the web. Port Washington relies heavily on content management with various parts of the website being updated almost daily! 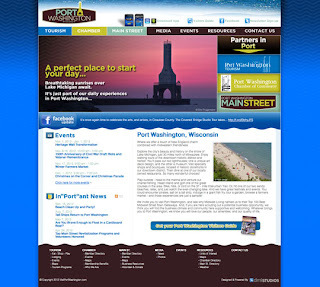 Port Washington has become the expert in their brand by publishing timely content and communicating daily with their distinct audiences. What can content management do for your brand? If you'd like to see a demonstration of our Content Management System, we'd be happy to show it off! Contact us and we'll be there. With bells on. This post is part of a series of Internet 101 information topics. As always, when class is dismissed, you're welcome to contact us if you have any questions or would like any additional information. If you don't feel at the head of your class, don't worry, we took notes. In the infancy stages of the World Wide Web, updating your website required fluency in HTML or having an on-call webmaster. The Internet has grown up quite a bit in the last 20+ years and content management is a powerful change. Content Management Tools (CMTs) (n.) are "forms" within the administrative area of a website that allow a web owner to quickly and easily update content on their website. What kind of content can be updated? A CMT can be created for virtually ANY content that you'd like to provide and update regularly on your website--News, Events, Products, Services, Testimonials, Video, Photos, Employment Openings, FAQs, Documents, Links, and the list goes on. Many websites start out as online brochures--well, you have to start somewhere! However, an interactive website that your audience can rely upon as a valuable source of information is much more powerful than an online brochure. You see, any valued relationship needs conversation. Imagine a dinner party guest that tells the same story over and over to each party attendant. After listening to the story time after time, people would begin to wonder what was wrong with that guy. What was his social faux pas? Aside from the plaid pants he was sporting, he also delivered the same story regardless of the audience--kind of like a brochure website. Now the life of the party, what was he up to? He had great stories to tell, listened attentively and enjoyed the conversation--he was dynamic! And, he was dressed like 007. CMTs allow your website to be dynamic and encourage conversation with your audience, so you can be the life of the Interwebs. 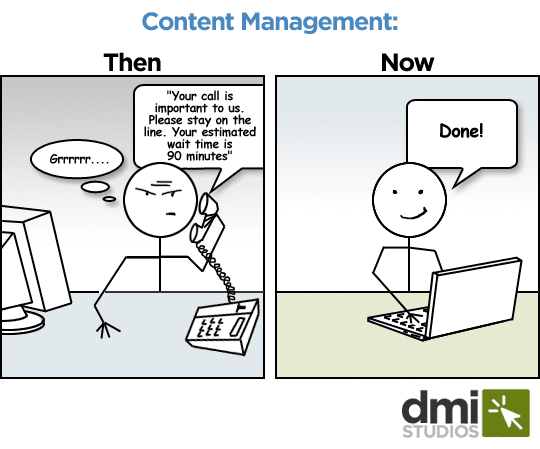 DMI Studios has proprietary Content Management Systems-loaded with CMTs to give your website a competitive advantage. If you'd like to see a Content Management System demonstration, we'd love to show off our work, you party animal.